Through a partnership with the United Nations Development Program (UNDP), DOT Lebanon participated in the Youth Leadership Programme (YLP), an empowering journey focused on investing in young women and men across the region as they unleash their potential to become leaders and powerful forces for change in their communities. 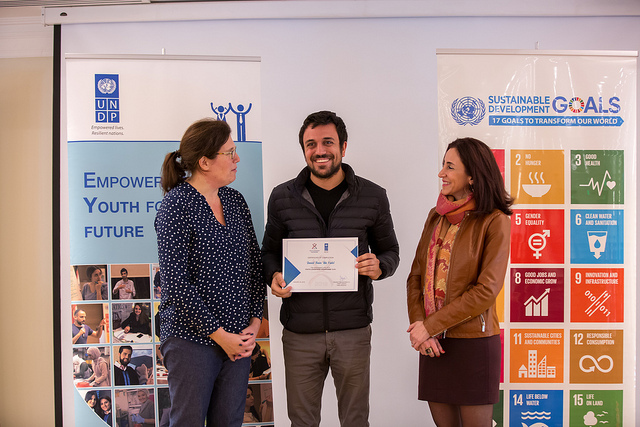 Participants in YLP were supported in establishing innovative approaches to sustainable development challenges, specifically focusing on gender equality and women’s empowerment, while strengthening their social entrepreneurship and digital skills. 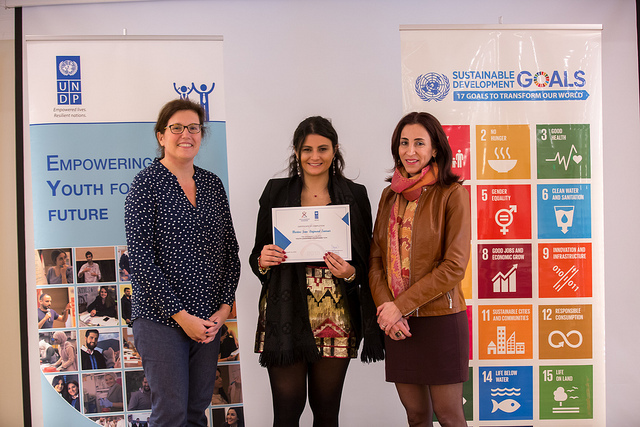 DOT Lebanon implemented nine training sessions aligned with UNDP programs for YLP between September 2018 and November 2018, including environmental awareness and gender equality. The curriculum was specifically designed for YLP based on DOT’s Impactathon and on some of the exercises and tools shared by UNDP during the Amman regional workshop. Additional workshop curriculum included basic project landscaping, support through ideation and prototyping, completing market assessments, pitch preparation, and field study research. YLP participants invested their time and focus for these nine consecutive sessions to bring their social innovation ideas to life. Following the workshop sessions, a community pitch day event was held for the youth to share their projects that would contribute to the Sustainable Development Goals (SDGs) and impact their communities. Upon hearing the youth project plans, the pitch day jury chose six finalists to represent the Mount Lebanon team and be trained by DOT Lebanon. Two youth from this team were also shortlisted to move on to YLP’s next level and represent Lebanon in Tunisia, competing at a regional level! Meet the two finalists and learn about their projects below. Escola is an educational platform that optimizes knowledge transfer between teachers and students. Escola offers a wide range of crowd-sourced content including instant feedback from students to allow teachers to enhance their teaching methodology. Jar Thuraya is a rural development platform application that “connects people and traditions” online. This initiative empowers women in agricultural and culinary fields (or women with these skills and affinities) and allows them to review and sell their hand-made goods and products through the app. Jar Thuraya combines four SDGs, converges tech with nature, and assists local women in generating income and independently from their families.